Scleral lenses are large diameter hard contacts that offer the most crisp vision combined with excellent comfort in a highly custom lens. the entire process to ensure a perfect fit. Scleral contacts are the latest innovation in durable contact lenses. Scleral lenses are a large diameter gas permeable contact lenses. They are designed to sit over the entire corneal surface and rest on the whites of your eyes (sclera), rather than a conventional contact lens that rests on the cornea. By doing this, scleral lenses functionally replace the irregular cornea with a perfectly smooth surface to correct vision. Additionally, due to their larger size, the lens sits completely underneath the lid, reducing lid friction. Who can benefit from a custom fit scleral lens? Due to the highly custom nature of the lenses, the fitting process may take several weeks to fine tune the lens to provide optimal vision and fit. Inserting the lens requires a moderate amount of manual dexterity, however most patients can learn to insert and remove the lenses relatively quickly. The fitting also includes a high resolution topographical mapping of the cornea (front surface of your eye) to best fit your eye. 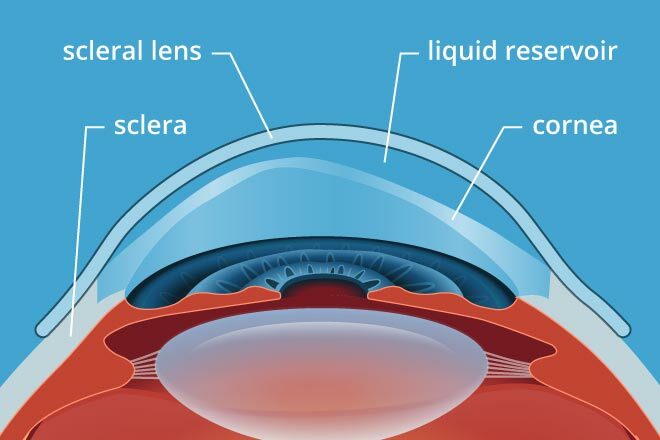 The other major difference between gas permeable lenses and scleral lenses is the space between the cornea and the lens itself. This space serves as a fluid reservoir to provide comfort for people with severe dry eye that would otherwise be unable to tolerate contact lenses.